What is Arabica Gourmet Coffee? We dedicate this post to our lovely readers who want to know more about the coffee world and the difference between Gourmet Arabica Coffee & Cheap Robusta Coffee. It frequently smells like burnt plastic or rubber. The Robusta coffee cup has a strong taste, it tastes bitter/ harsher often described as burnt wood, grain-like. Green Robusta Coffee is about 50% cheaper than Arabica Coffee. Robusta is more insect-resistant than Arabica because the high caffeine content helps to protect the Robusta coffee plants from pests. Large coffee shop and multinational coffee business mainly commercialize Robusta Coffee to enhance their profits. It’s difficult to cultivate and harvest. An excellent Arabica coffee grows in unique ecosystems & at a high altitude. It’s harvested by hand to assure quality. Arabica plants are more sensitive to temperature and handling and are very vulnerable to pests. Arabica coffee is sweet and aromatic with a vast range of natural flavours. Arabica coffee is the only one that can be enjoyed on its own without being blended with other types of coffees. Arabica coffee has a low caffeine content. Why Is Mexico Real Cafe A Gourmet Coffee? 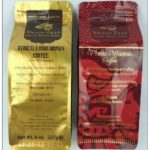 Mexico Real Cafe’s Collection of Pluma Oaxaca Coffee & Maya Elixir Chiapas are Gourmet coffees because they are made up 100% Strictly High Grown Arabica coffees. Our coffee beans grow wild under the shade of tall trees, at high altitudes (1400 & 1600m. ), in volcanic soils and are picked by hand by the descendants of the Maya and Zapotec cultures. Mexico Real coffees also grow in unique ecosystems and are traditionally grown. Our coffees are farmed in an environmentally friendly way and are free of pesticides, making it so that cultivation does not damage the ecosystem where our coffee grows. Our Maya Elixir Coffee grows in The Maya Biosphere Reserve. This majestic tropical rainforest is home to wild animals in danger of extinction, such as the Jaguar, Quetzal, Pavon and other exotic birds, mammals and plants. Our Pluma Oaxaca Coffee grows next to Oaxaca’s virgin beaches, mangroves which are the home to crocodiles, and the largest turtle sanctuary on the Pacific Coast. The name Pluma (feather) was inspired by the dozens of birds arriving to the mountain where our Pluma coffee grows wild. The combination of high altitudes, the unique ecosystem, intensive hand care, artisan growing techniques, the love and knowledge of our coffee growers, and the quality of our Arabica coffee plants result in one of the best coffees in the world. Mexico Real Café was awarded 2 gold stars in the Superior Taste Award in Belgium 2016, for its gourmet quality and unique flavour. You can enjoy a cup of Mexico Real Arabica Coffee with your mates or loved ones, at home, or at your office and Stay Healthy While Drinking Coffee. There are many health reasons to drink coffee. Continue reading our Mexico Real’s Cafe blog and you will find many interesting coffee facts and posts about Mexican culture.